With the Northeastern United States being barraged by successive snowstorms, we offer this taste of summertime bliss to remind everyone that warmer months are always just around the corner. 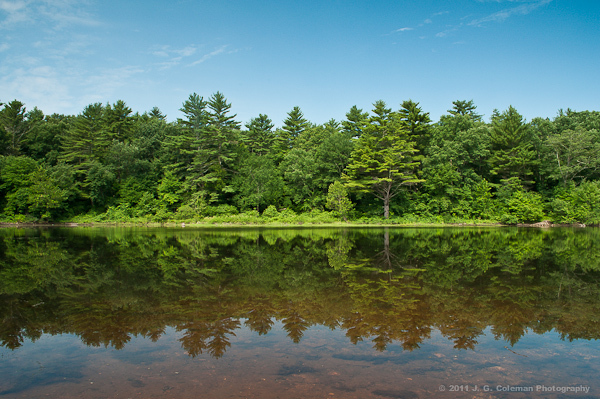 Here, the idyllic, forested shores of Mansfield Hollow are reflected in the calm waters below. Mansfield Hollow is a prominent state park in Connecticut, offering a sizable 500-acre lake. Interestingly, the landscape here would’ve looked remarkably different before the mid-1900’s. The area beneath the lake was once dry land traversed by the Natchaug River. In 1952, the United States Army Corps of Engineers completed a dam along the Natchaug that entirely transformed the river basin into a reservoir. Photograph of Mansfield Hollow © 2011 J.G. Coleman Photography. View more photography by Trails of Freedom Chief Researcher, Justin Coleman, at J. G. Coleman Photography.